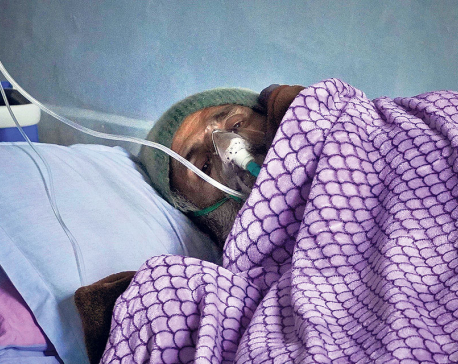 KATHMANDU, Jan 19: Dr Govinda KC, who was staging fast-unto-death in Ilam, was airlifted to Kathmandu on Thursday midnight and admitted to the intensive care unit (ICU) of the TU Teaching Hospital in Maharajgunj. His condition is critical but stable, according to doctors involved in his treatment. Before this, a team of doctors from the BP Koirala Institute of Health Sciences, Dharan which visited Ilam to assess Dr KC's condition had said that Dr KC's condition was deteriorating rapidly and he needs to be treated at ICU. Dr KC has developed problems in the heart and lungs, according to the doctors. 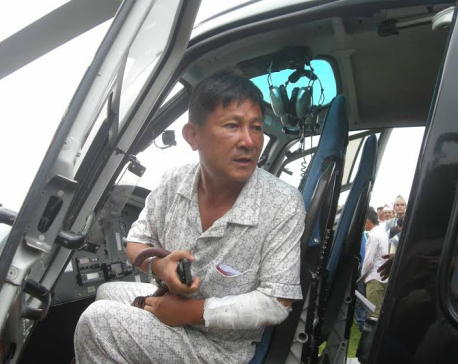 Nepal Army's night vision helicopter was used to bring him to Kathmandu. At the TUTH, a five-member team led by Internal Medicine Department Chief Dr Pradip Krishna Shrestha is involved in Dr KC's treatment. Other doctors in the team include Dr Sawin Thapaliya, Prof Dr Divya Singh Shah and associate professor Dr Pankaj Panta. TUTH managing director Dr Prem Khadga said Dr KC is suffering from chest problem, muscle cramps and fatigue. 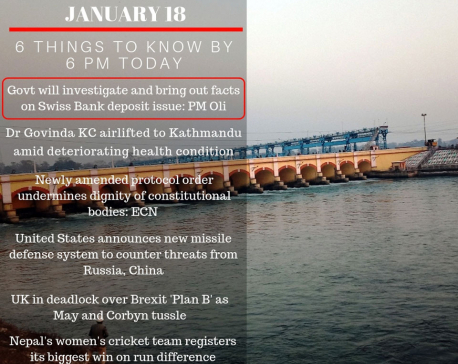 “His blood pressure level, sugar in blood, electrolytes and phosphorous levels are on lower side,” said Dr Khadga. “However, his condition is stable now. Dr KC has not taken anything orally,” he added. “We are waiting for the results of further tests.”Dr KC is on his 16th fast-unto-death hunger strike since January 9 after the government did not implement all his demands included in the agreement signed with him. On the sixth day of the hunger strike his condition worsened and he was admitted to the District Hospital, Ilam. While entering the ICU at TUTH, Dr KC said that he will continue the fast-unto-death and not take any medicine until he falls unconscious. Earlier on November 19, Dr KC was admitted to the critical care unit (CCU) of Manmohan Cardiothoracic Vascular and Transplant Centre at Maharajgunj under the Institute of Medicine (IOM) on November 19 after developing chest problem, and was discharged after three days. Dr KC is suffering from myocardial bridging in which heart muscle presses the heart artery. This causes chest pain. 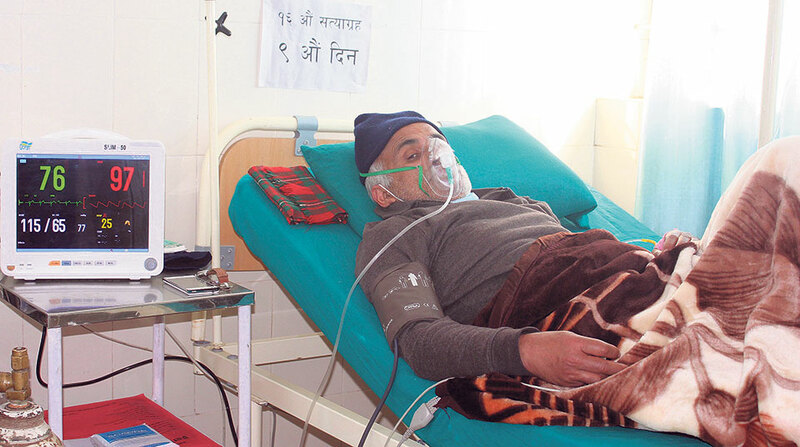 Dr KC suffered from a similar chest problem three years ago during his hunger strike. Dr KC has staged hunger strikes for over 200 days in total since 2012 demanding crucial reforms in the medical education sector. His 15th hunger strike, the longest so far, was ended on the 27th day on July 26, 2018 after the agreement promised to address all the demands put forth by Dr KC. The government has so far not taken any initiative to discuss Dr KC's demands, according to Pritam Subedi, a supporter of Dr KC.